Lisa Pammen has spent most of her working life in the NHS - first as a paramedic and then as a manager of a group of GP practices. But when she really needed the NHS, it was not there for her. For 18 months, she struggled with abdominal pains - but despite visits to the GP and hospital, her cancer was not spotted. 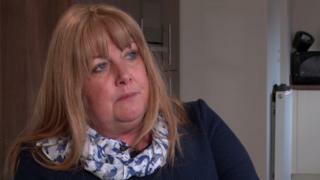 Only after the 49-year-old ended up in accident and emergency (A&E) was she diagnosed with late-stage bowel cancer, which had by then spread to her ovaries and abdomen. It took her three months to start treatment from the original GP referral - despite the fact the NHS is meant to do this within two months. Mrs Pammen, from York, said: "I feel let down. "It was extremely frustrating as I felt like I was left floundering for weeks and no-one was listening to me. "I was in intense pain and had a family history of bowel cancer and yet it felt like these things were being ignored. "I genuinely feel that because of these long referral times all my worry and anxieties were heightened, and it's made the treatment 10 times harder to deal with." Sadly, the problems experienced by Mrs Pammen are not unique. Latest figures from the NHS in England show only half of patients are diagnosed at an early stage, while nearly one in four patients waits longer than they should for treatment to start - the worst performance since records began, in 2009. Sara Hiom, of Cancer Research UK, said the whole system was being undermined by a lack of staff. "The figures show an NHS under continued strain, with many patients still waiting too long to get a diagnosis and start treatment." Pressure has been growing for some time. The target to see patients within two months has been missed for more than three years. In fact, this target has been met in only three months out of the past 60. And during that time, 130,000 patients have waited longer than they should have for their life-saving treatment. Dominic Bell, a manager at Macmillan Cancer Support's helpline, said it was as bad as he had known. "I've worked on the support line for the last seven years and throughout that time we've taken more and more calls from people going out of their mind with worry while they wait for a diagnosis and treatment. "Dealing with the prospect or the reality of a cancer diagnosis can be one of the most difficult experiences people will go through in their lifetime." Other parts of the UK are also struggling. Scotland, Wales and Northern Ireland all expect 95% of patients to be seen in 62 days. The last time any of those nations met the target was 2012. And, of course, the problems are not just confined to cancer. The latest figures show A&E performance has also dropped to its worst level. Under 85% of A&E patients were seen within four hours during February - well below the 95% target. Patricia Marquis, of the Royal College of Nursing, said: "What's worrying about all the figures is that they come at a point when we haven't yet had severe weather in England, and flu and norovirus levels are low." A spokesman for the NHS in England accepted there were challenges but said the increases in demand had been "significant". He said extra money was being invested in the health service in the coming years to provide more care to more people.